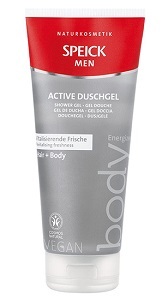 Speick Men Active Shower Gel has been formulated using invigorating, active and moisturizing plant-based ingredients such as organic Reed extract and Vitamin F, which provide long-lasting moisture to the skin and hair and protect against harmful environmental factors. This combination of ingredients, along with the harmonizing extract of the High Alpine Speick plant, leave both skin and hair feeling revitalized and gently nourished after your shower. This Vegan product is free of synthetic fragrances, artificial colors, silicones, parabens and mineal oil-based ingredients. Both gluten-free and lactose-free, it has been dermatologically and allergologically tested and approved. Speick Natural Cosmetics from Walter Rau Gmbh of Germany are the only products in the world to contain the extract of the Speick plant, which has been prized for centuries for its unique calming and harmonizing properties. As developers and manufacturers of one of the very first natural product lines, this company was producing natural cosmetics long before public awareness created a booming market for natural skin care products.